From the kitchen of One Perfect Bite...There was a time when I'd have blanched if asked to bring wine or drinks to a party. In my mind, there was always something about that request that indicated incompetence or the inability to cook. I'm no longer quite so proud and was delighted when asked to supply libations for a party we'll be attending this Sunday. We live on the West coast, so, for us, the Academy Awards begin and end at a human hour and allow us plenty of time for people watching and raucous rounds of applause or cat-calls. We do eat, but on this occasion fancy drinks become slightly more important than they might otherwise be. One of the drinks I've planned is designed specifically for the gals. While it's served in martini glasses there is nothing about it, save vodka, to tie it to its more potent cousin. It's a great, if strong, drink for luncheons, showers and other special occasions. Be forewarned, the snake oil salesman in me is about to surface. Ready? It's also good for you because of all the calcium rich cranberry juice that's used to make it. I also sell bridges and oil wells if you're in the market. This is really simple to do and cranberry flavored syrup can be made several days before using if it's refrigerated. Here's the recipe. 1) Combine orange zest, lime zest, sugar and water in a medium pan. Bring to a boil over medium-high heat, stirring until sugar is dissolved. Cool slightly. Place cranberry juice in a 1-quart jar that has a lid. Add sugar syrup and close jar. Shake to combine. Refrigerate for up to 5 days. 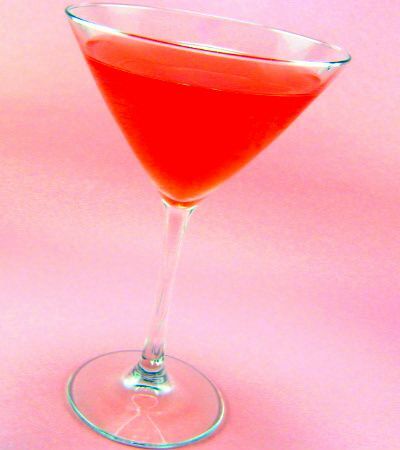 2) To make one drink, combine 1/2 cup of cranberry syrup and 2 ounces of vodka in an ice filled cocktail shaker. Shake well. Strain into a cold martini glass. Yield: 6 drinks. I so want one, right now! Can you just pass it through the monitor screen please Mary? It looks delicious--and such a pretty color too! beautiful colour! vibrant and alluring !wld be hard to refuse a drink like that. Now THIS is the type of recipe that I can probably make successfully--and really enjoy! I will certainly give this a try! Sounds like a drink the wife would love and since I like the cranberry flavor, maybe me too if its not too sweet. We'll give it a try. Sounds wonderful and it is good for me, too. Love that part! Happy Pink Saturday! Gorgeous! Going to bookmark this for next Christmas! I just love the color! Thanks for visiting my blog Mary and I am going to try this cocktail - yummy. O, Mary...you so crack me up.. This drink is a MUST try for me. It sounds and looks delicious. I wish I had a huge drink of it right now...and it's not even noon. But...hey....it's 5 o'clock somewhere, right!! Oh I want a whole pitcher of these! Cheers! Such a pretty color. You amaze me. I featured you on my blog today!! Happy Pink Saturday!! OOOOO my favorite femmy drink! I am going to make this one for sure! Thanks! How FUN! I wish I'd thought of an Oscar party earlier. Perhaps I can still get some girls over. I love looking at all of the dresses too and the men just don't understand. You'll have a great time, especially with these pretty drinks. As it turns out, we had no cranberry juice on hand but some raspberry instead. So I made up a batch and they are indeed good, but like any martini, can definately hurt you. thanks for the recipe. I love cranberry! This looks amazingly delicious. I so wish I had one of these now! I'm going to print this out for one of the gals nights, it would be perfect. Thanks! cheers to this...feeling the thirst! This sounds like a lovely cocktail! Larry, I'm so glad you liked the drink. Thanks for letting me know. Mary, mary, mary...I really wish I lived earby. I mean, I can picture coming by and baking with you while we sip lovely drinks....this would occur every Saturday. I couldn't wait to see what your pink dish would be. It sounds & looks delicious - love the colour too. Happy pink saturday Mary! Have a great week. Cranberry and vodka are definitely a match made in heaven. I love that you added lemon and lime to it. A great balance of flavors! Now this is my kid of cocktail. I love the combination of cranberry and vodka - it goes down far too easily. Cape Cods are my #1 favorite cocktail. I like your version and it looks like I have a new Happy Hour cocktail to add to my Friday night tradition with hubs. Thanks! What a weekend with cranberry thoughts and vodka! I'm not a fan of sweet drinks, but this one is very tempting, Mary. I would like the combination of juices that you've used. And fruit juice is good for us...right? I would love to sip a few of these while watching the awards tonight. Have fun!! I will be sure to try this cocktail recipe, because I sure could use a cocktail! This sounds YUMMY! I drink Cape Cods and this sounds much nicer! love cranberry and vodka. Your recipe is grand and it is so very pretty and celebratory. Love cranberry and vodka and I'm a fan of sweet drinks. This one is a must.